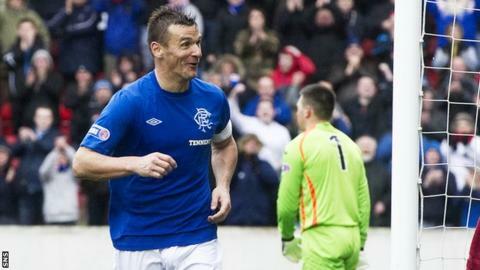 Rangers captain Lee McCulloch has signed a two-year contract to keep him at Ibrox until 2015. McCulloch's previous contract expired at the end of this season and his new deal takes him to his 37th birthday. The 34-year-old, who has spent much of his career in midfield, has scored 14 goals this season after being given a striking role. McCulloch was handed the captaincy at the beginning of the current campaign, with Rangers now in Division Three. His latest goal came on Saturday as Rangers defeated Clyde 2-0 to record their first away win of the season and climb two points clear of Elgin City at the top of the table with a game in hand. The player capped 18 times for Scotland began his senior career with Motherwell and had a six-year spell with Wigan Athletic before returning to the Scottish Premier League with Rangers in 2007.